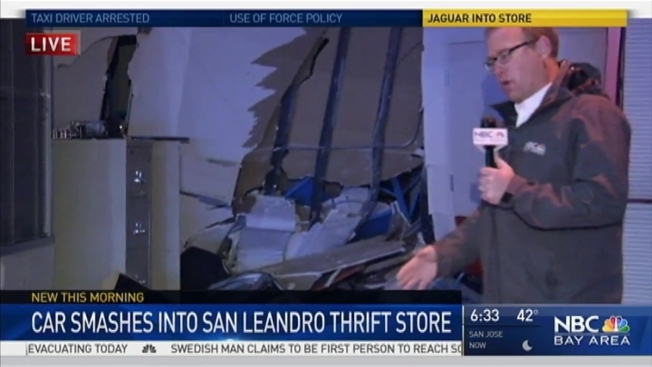 A Jaguar slammed into a thrift store and neighboring salvage company early Thursday morning near San Leandro and witnesses told the California Highway Patrol that they say young kids running away after the crash. The crash was reported at 1:24 a.m. at Thrift Town Thrift Store at 16160 E. 14th Street, according to a CHP officer at the traffic management center. It is technically in the Alameda County Sheriff's jurisdiction. When officers arrived, no one was at the site, the CHP officer said. Law enforcement then called the registered owner of the Jaguar, which typically means the car was stolen or taken by someone in the family without the owner’s knowledge.